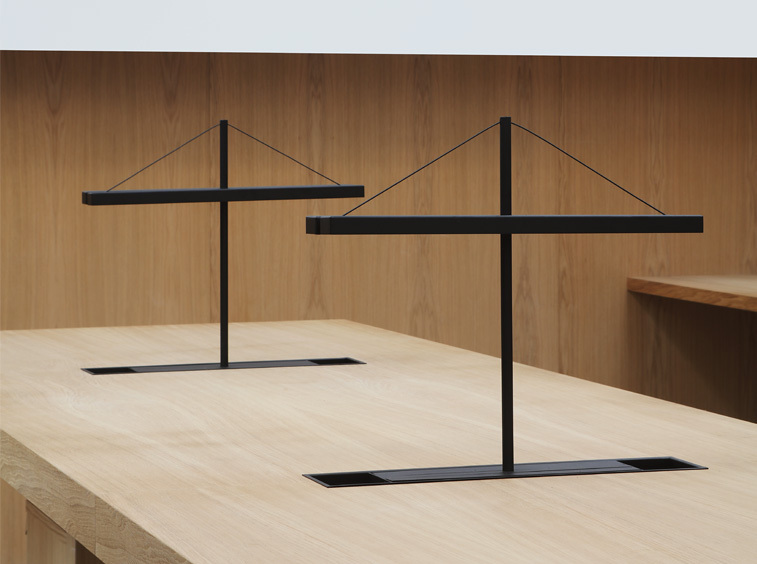 We fell in love with the traditional library lamp, but felt in needed a reinterpretation. Started with the goal of achieving a minimal yet industrial design that could accomplish as the traditional does, an extraordinary balance between light and shadow. The beauty of light, as we understand it, is a matter of reaching the right equilibrium between darkness and brightness. Getting full darkness as a starting point and filling up the spaces with the right level of light on every specific spot is the secret to successful lighting. It was clear to us that our library table lamp had to distill the idea of equilibrium that we were so fond of. Working with traditional blacksmiths brought us the more industrial mechanized solutions, getting us closer to the engineering world. After a series of concepts, we reached an elegant and balanced design that provides the right amount of light to reach the equilibrium between light and shadow. The lamp becomes a sculpture claiming to be lit as so.